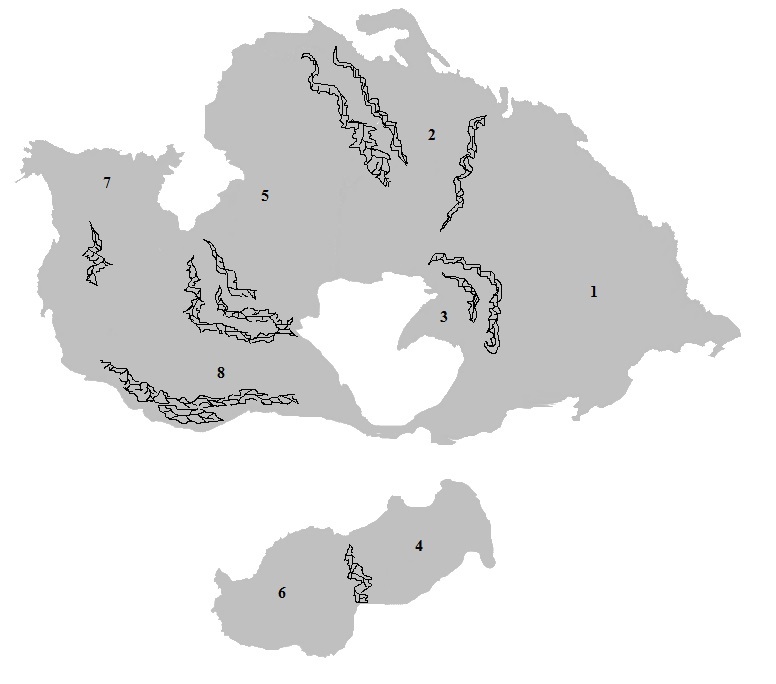 While zones are an oversimplification of the vast diversity of landscape in one area of the map, they represent the common nature of environment typical to the section of the supercontinent they are a part of. Different races begin at different zones and the movement to include other areas of the map is determined largely by the gameplay and nature of cards drawn. Some Sickle and Wild cards may open up areas to habitation and the total number of populated zones are one of the measures of success at the end of the game. Badlands and deserts, this area gets precious little water except around a few rivers that cut across the landscape. While life is capable of surviving here, the northern portion of this zone is especially inhospitable to most life forms. Much of the rain that might fall on this zone is diverted by the mountains, but those same mountains provide many streams and springs that flow into rivers and countless lakes. Because of this, this zone is often swampy and humid. Many clouds form here and channel South to release into the great sea. Hot, but sheltered from most sudden environmental shifts, this area is prone to frequent rain. It has become densely forested. More cool in temperature than most other zones, there is a wide range of environments here. It is one of the areas of the world where freezing temperatures are the norm in the winter. Open and hilly grassland is home to many herds of animals and teaming with life. Partially sheltered from the harsh weather to the West, but close enough to still receive regular doses of rain, it has become one of the more stable environments. Harsh both in weather and temperature, much of this area stays cold year round. The only counterpoint is that there are a number of hot springs helping to keep it from freezing over a vast portion of its surface. Hit the hardest by regular ill weather in the form of hurricanes and monsoons, This is an unforgiving zone where life has to be cunning to survive. Much of the weather that hits the Western coast channels between the two mountain ranges, causing there to a yearly series of tropical storms and hurricanes to race across the land. Lush growth abounds, but it has had to diversify to survive. Oceans = Much of the oceans have grown still below the surface. This has led to far less diversity of life and many dead zones that move slowly through the great waters. Conversely, volcanic activity below the deep waters has increased thanks to less tectonic release. It creates a strange patchwork of life and empty spaces, as well as thousands of little islands at sea. The Great Sea = Gaining a great deal of fresh water and oxygen, the great sea is a swarming mass of living things. Some creatures from the deep migrated prior to it's closing off to the oceans and have adapted, others have newly arrived in the evolutionary sense. Because of this, zone 3, 5 and 8 have seen a migration back and forth between land and sea. Each round of phase 2, movement into new zone is allowed as long as the requirements of that zone are met. Those requirements are listed below.